Coat: Inner coat on neck and thighs, short dense outer coat lies close to skin and is firm and glossy. Is a Rottweiler the Right Dog Breed for You? 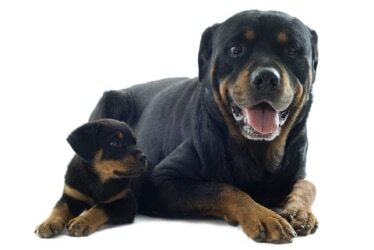 Rottweilers were originally used as guarding and herding dogs because of their willingness to work and strength. They have intense protective instincts and can be self-assured and calm, although some lines have tended towards a tendency to aggression. They are highly intelligent with high trainability, but are recommended for an experience and committed dog owner. Tolerance to children can vary and males tend to exhibit more inter-dog aggression and dominance. They have a moderate need for exercise and can be suited to a more urban lifestyle. They have low grooming needs and are moderate shedders.